8 ultra-thin winged pads for overnight use Sustainable, biodegradable bamboo & corn fibre pads in recyclable packaging Tsuno supports One Girl and other charities helping to empower girls & women Tsuno’s overnight pads are winged and extra-absorbent, but still soft and ultra-thin for comfortable dryness through the night. The softness comes from a top sheet of natural corn fibre, while the absorbency’s down to a middle layer of bamboo fibre. Underneath, there’s a film of leak-proof, breathable polyethylene – but no chlorine or dioxin bleach anywhere. 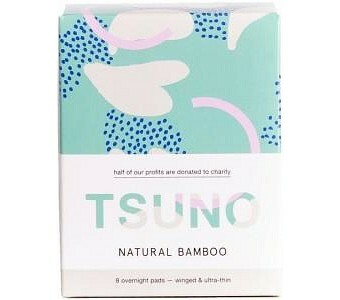 These are premium pads with a purpose: Tsuno support vulnerable girls and women in Australia and throughout the world by donating half their profits to One Girl and other charities, and bamboo is an exceptionally sustainable and ecofriendly crop whose production consumes fewer of the earth’s precious natural resources. It’s also completely biodegradable, and the packaging is recyclable too!